Philosophical Roots of Secular Jewishness/Judaism When and How Jewishness Adapted to a Secular World. The Secular Jewish movement is composed of those who, in the words of Saul Goodman in his book The Faith of Secular Jews, seek to integrate the “prevalent ideas of modern Western culture with the historic Jewish heritage.” The movement is focused on human endeavor and life on earth. Secular Jews believe that the Jewish religion grew out of Jewish culture, of which that religion is a part. Secular Jewishness (or as some prefer, Secular Judaism) is based on three ideas. The most important of these is the survival and continuity of the Jewish people. Secular Jews are an integral part of the Jewish people and identify with its history and culture. The second central idea is that humans are responsible for what happens on earth, beyond that which is controlled by natural forces over which humankind (so far) has no control. They believe that the secular ideals of the Hebrew prophets — a world of sufficiency for all, with peace and justice — will not occur without human action. The third central idea is that life is the most important focus of human activity and ideals. Very much part of mainstream Jewish thought is the concept that actions speak louder than words. None of these three central concepts are divorced from Jewish “normative” tradition except for the belief that humans are the only conscious power. Secularists of today accept no philosophical dogma. Belief in the supernatural is neither encouraged nor discouraged. It is considered a private matter. The Jewish people and their philosophical system — which we identify as Judaism — were from the very beginning concerned about secular issues: life, relations between people, relations with other peoples, ethics, and morals. The Tanakh and Talmud have much in them that is secular in concern and content. What one did was thought to be more important than what one believed. Several times in Jewish history —particularly during the Renaissance, the Enlightenment, and then again in the late 19th and early 20th Centuries — many Jews shed the “religious” or God-oriented elements of their Jewishness. Yet they refused to be totally assimilated into their societies or adopt the religious beliefs of others. In the late 18th century, Jewish intellectuals began a Jewish Enlightenment, or haskalah, which flourished in the 19th century. After the French Revolution, Jews in much of Europe were allowed and wanted to join the larger society in which they lived. Unfortunately, Yiddish, the language of the mass of Jews, was thought by some to be inferior. As a result, successful joining with the modern world was possible only for those who spoke the language of the dominant culture. At the end of the 19th century, Jewish intellectuals began to lose their disdain for Yiddish — the language of the Jewish masses both in Eastern Europe and the immigrants to the Americas — (This is set out in detail in the book The Rise of Modern Yiddish Culture by David Fishman). They began a conscious building of Yiddish into a modern language of learning, science, the arts, and literature. Intellectuals like Chaim Zhitlovsky, Simon Dubnow, and others set out to develop a secular, cultural philosophy of Jewishness. A similar development took place in the development of modern Hebrew. Theodore Herzl, usually considered the founder of modern secular Zionism, set forth the concept of the Jews as a separate people or nation needing their own land and developing a modern Jewish culture. The dream of the messianic era was transposed into a dream of a “better and more beautiful world.” Most of the Jewish religious establishment of the time strongly opposed these movements and developments. The Orthodox rejected modernization and any changes in Jewish life without a Messiah. Others preferred the French idea of rejecting Jewish peoplehood. They opted instead for a purely religious definition of Jewishness as, for example, “Germans of the Mosaic Faith” (or Russians, Poles, Serbs, French, Italians, etc., of the Mosaic Faith.) Secularists developed Yiddish theater, literature, poetry, and art to enhance Jewish self-esteem and help Jews adapt to a “new” world as Jews. Jews were to engage in science and active participation in the intellectual life of Western society, as Jews. The newly formed Kehila for Secular Jews in Philadelphia proudly carries on that tradition. Previously, Jews who wanted to participate in the larger world had often converted to Christianity, with some notable examples being Heinrich Heine, Gustav Mahler, and the Mendelssohn children. As the idea of cultural Jewishness developed around the turn of the 20th century, Chaim Zhitlovsky set out guidelines for a network of secular Jewish schools, either as full educational institutions or to supplement governmental education. They were to teach children Jewish culture as part of modern civilization. From this grew several systems of Yiddish-oriented, secular Children’s schools that spread throughout the United States and Eastern Europe. The most prominent were those of the Workmen’s Circle and the Labor Zionists. The Philadelphia Jewish Children’s Folkshul is one of these schools, although instruction is in English today. The philosophical underpinning of these developments was that Jewish history, experience, and culture — without supernatural embellishments — were themselves sufficient to sustain Jewish peoplehood in a world of science and secularism. The secular ideal was human action, in Jewish formats, to change society and end the persecution of the Jewish people. The secularists opposed assimilation in favor of a proud affirmation of being part of the history and culture of the Jewish People, autonomous and self-directed, equal partners with all other peoples in the movement of human history and knowledge. 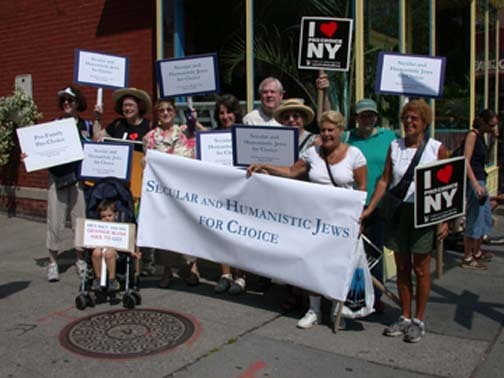 Modern-day Secular, cultural, humanist Jews and Jewish organizations continue that proud heritage and philosophy.